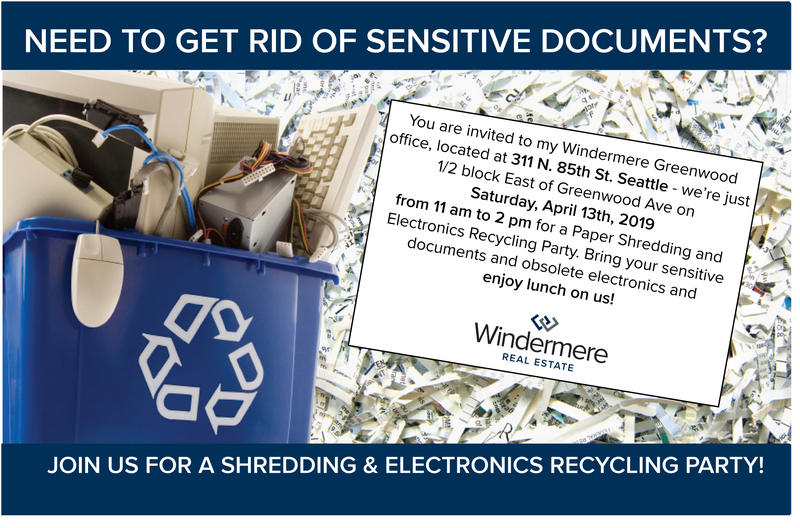 Join Us for a FREE Shredding & Electronics Recycling Party! 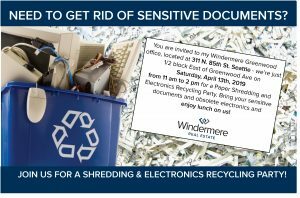 Windermere Greenwood will have two trucks on site to shred your sensitive paper material and to recycle obsolete electronics. Items Accepted: Desktop & laptop computers, monitors, cell phones, iPods, keyboards, mice, power cables, scanners, copiers, ink/toner, software and TVs under 48″. Not Accepted: DVD Players, VCRs, microwaves, stereo equipment, kitchen or other appliances, TVs over 48″, styrofoam or cardboard. We will be serving grilled brats, veggie & hot dogs, soda, chips, coffee, cookies, and a smile to thank you for your support! Starting in 1964, natural gas heat began to gain popularity as the source for heating homes in Seattle. Older homes in our more established neighborhoods may still use oil heat, but many more have converted to natural gas or electric heat in the meantime. What happened to all those old oil tanks? How do I determine if there is an oil tank on a property, and whether or not it has been decommissioned? This is not an uncommon question to answer as a Realtor when a home is sold and transferred to a new homeowner. To determine if an oil tank is still located on a property – or if it has been decommissioned, you used to hire a fuel company to locate the tank. The Seattle Fire Department does not have records of the location of underground heating oil tanks, because a Fire Department permit is not required to install underground heating oil tanks. However, records to remove or decommission an oil tank under permit after 1997 for residential properties; and after 1984 for commercial properties should be available at from the Fire Marshal. Several years later, you could contact the local Fire Marshal’s Office. You had to submit your request by fax and archived records would be manually researched and you could receive a report in a few days. The City of Seattle now has most of these records digitalized. You can now easily search by address for a decommissioning permit through an open source database. The Open Data Program makes the data generated by the City of Seattle openly available to the public. You can find out information immediately now! A record with incomplete tank info indicates that the required follow-up report has not been received by SFD. If you need to investigate the possibility of an abandoned oil tank further, most oil tank companies offer locating services if you are unsure if – or where an underground storage tank is buried on the property. It would be important to know the exact location and depth before doing major renovations or additions on the lot. A fond farewell to the old and cheers to the new! May you have a healthy, prosperous New Year! 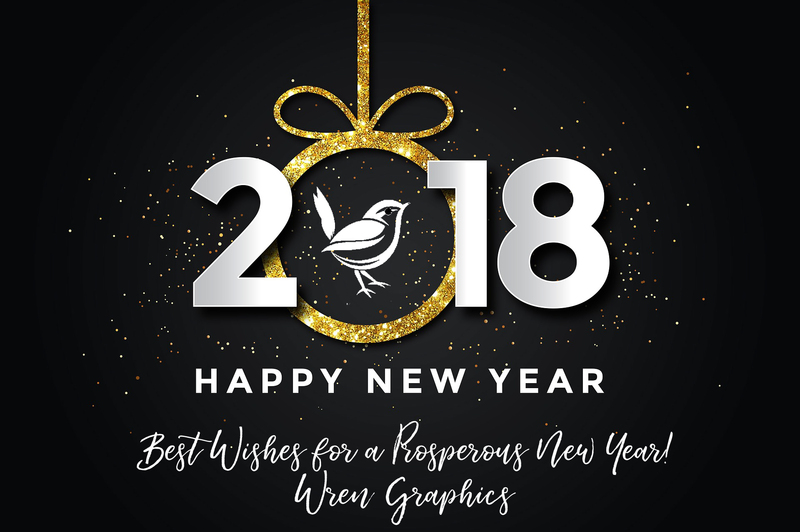 Wren Graphics will be happy to assist you in 2018! As Thanksgiving Day approaches, I would like to express my gratitude to everyone and hope you have an amazing Thanksgiving holiday weekend. May your holiday be full of joy, spending time with family & friends and, of course, delicious food! 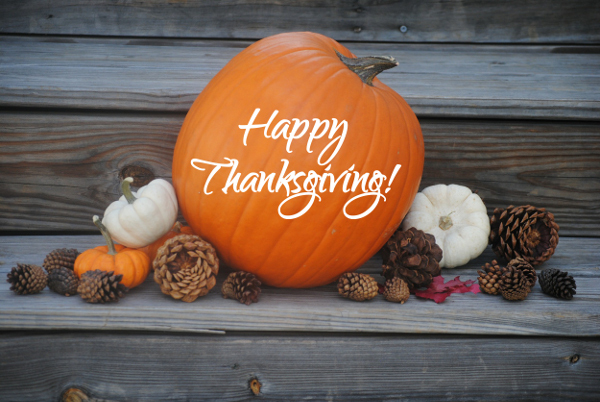 Renée will be checking email and messages, but will be out of the office until Monday, November 27th. Get in the spooky spirit by giving blood this Halloween! 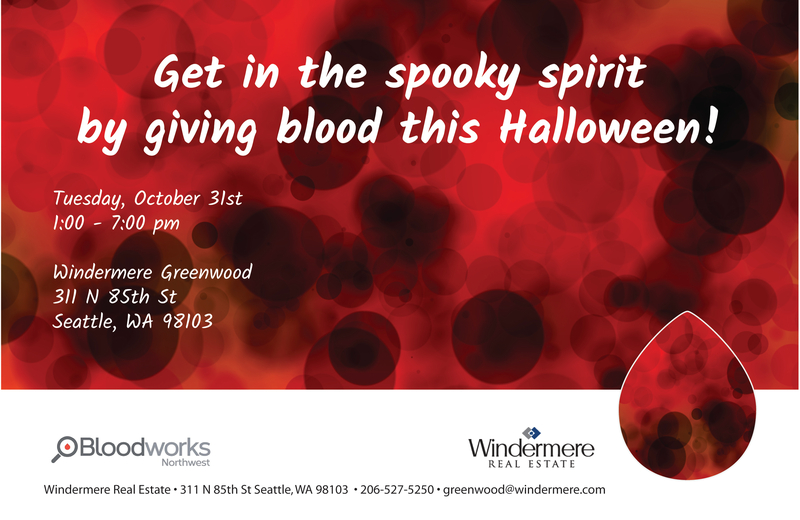 Bloodworks NW will have a mobile truck in our Windermere Greenwood parking lot at 311 N 85th St Seattle, WA 98103 from 1:00 – 7:00 PM on Halloween – October 31st. Please call my office at (206) 527-5250 to reserve a time slot to donate (some walk-ins can also be accommodated). All donor participants will receive a pair of vampire fangs and be automatically entered to win an invitation to a private party with Seattle Seahawks linebacker Bobby Wagner! All you have to do is show up at Bleed for the Blue and Green! How Do I Find Out If There’s an Abandoned Oil Tank on my Property? Natural gas heat was starting to become the most popular type of heating system for homes in the Seattle area starting in 1964. Older homes in our more established neighborhoods may still use oil heat, but many more have converted to natural gas or electric heat in the meantime. What happened to all those old oil tanks? This is not an uncommon question to answer as a Realtor when a home is sold and transferred to a new homeowner. To determine if an oil tank is on a property – or if it has been decommissioned, the first step is to contact the local Fire Marshal’s Office. The Fire Department does not have records of the location of underground heating oil tanks, because a Fire Department permit is not required to install underground heating oil tanks. 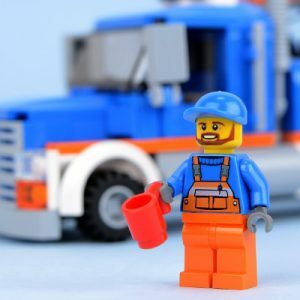 However, the Permit Section staff in the Fire Marshal’s Office for the City of Seattle, can check for any record of the removal or decommissioning of an oil tank at your address conducted under permit after 1997 for residential properties; and after 1984 for commercial properties. The City of Seattle is now processing public disclosure requests through a web portal called the City of Seattle Public Records Request Center (PRRC). The PRRC is designed to assist you in organizing and tracking the progress of your request(s) and downloading records. With the transition to the PRRC, the City will be charging minimal fees for copying and transmitting electronic and non-electronic records in accordance with state law. Submit your request(s) into the PRRC website and the City will communicate with you through the PRRC going forward. All communications sent via the PRRC will appear in your email and can be tracked through your PRRC account. You will receive an email with your login information and additional instructions regarding your current request for records. 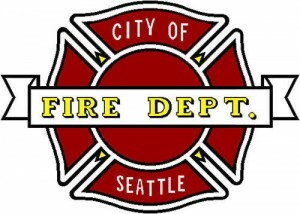 Most decommissioning reports have only been in place for the past 15 years, so if it was done earlier, a Seattle Fire Department permit was not required to remove or decommission an underground tank. Other cities are similar in this method of investigation, so depending on where you live, you’ll want to contact the fire department responsible – whether in city limits or with the County if you live in an unincorporated area. If you need to investigate the possibility of an abandoned oil tank further, most oil tank companies offer locating services if you are unsure if – or where an underground storage tank is buried on the property. I’m usually good for a half dozen good dork moves a year when it comes to my car. Usually, it’s leaving my lights on and running down my car battery. For some reason, my car doesn’t chime at me when I leave my lights on, and is old enough that it doesn’t have the auto-off lights feature. One of the best gifts I ever received was a portable emergency jump box that can start a battery, charge your phone or pump up a flat tire. As long as I remember to charge that puppy up once a month or so, (and remember to put it back in my trunk), I can get myself out of a jam. Then, there’s running out of gas. I’ve been rescued more than a few times by friends and AAA for misjudging how far one can go after seeing the little yellow gas can appear on the dash. That, and my gauge is fairly unreliable – I’ve had the fuel sensor in the tank replaced, but not the one in the dash. So I pay careful attention to my trip meter & make sure I fill up at 250 miles. Today was a new dork move for me. I locked my keys in the car – along with my phone and purse while pumping gas at the station. No phone = no way to phone a friend. No AAA phone number or membership number. Had I even renewed it recently? I wouldn’t have a had access to my purse to immediately sign up with my credit card! However, last time I renewed my car insurance with Safeco, I received a little sticker for their Roadside Assistance program. I don’t think I even realized this was an option with my policy until I saw the little sticker with my renewal card! Thankfully, I stuck it on my windshield. The station attendant let me borrow his phone and I called the number. In less than 1/2 hour, a friendly towing co. guy showed up with a little funny blood pressure balloon device to get enough space to insert another funny little device to flip open the lock. No fuss, no muss, no money. Just my signature on his iPhone app and I was back on my way! Does your car insurance plan include roadside assistance? I know I am so grateful for this perk included with my Safeco policy!! So, until I replace my car with one that will turn my lights off for me and has a more reliable gas gauge, I will remember to utilize the Roadside Assistance part of my insurance policy when necessary! I am not just my day job. I don’t always sit in front of a computer creating logos, flyers and editing photo galleries for real estate. I don’t always show houses to clients, arrange for home and sewer scope inspections or coordinate paperwork with lenders, escrow and title companies for real estate transactions. In my free time, I am a creative. I paint… I draw… I carve rocks! So, I’m playing hooky from my day job today! (Thursday, February 23, 2017) I will be spending the day hosting the Northwest Stone Sculptor’s Association (NWSSA) booth at The NW Flower & Garden Show. This event is aways amazing… There are hundreds of garden displays, seminars and vendors to peruse. 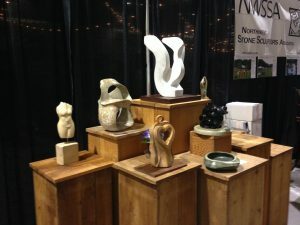 The NWSSA is a group that I love – amazingly gifted artists who share my passion for carving rocks. I’m currently their “virtual assistant” helping out with design, marketing, website updates & cultivating social media. So if you happen to be at the Flower & Garden Show at the Convention Center in Downtown Seattle, stop by booth #2502. I’ll be there Thursday & Friday afternoon, however, I encourage you to stop by, consider making a sculpture the focal point of your garden or pick up a chisel & hammer and chip away at our demo sculpture in progress! There were once a king and queen who had three very beautiful daughters. Psyche, the youngest and most beautiful, was treated like a goddess by the local people. Jealous and infuriated, Venus, goddess of Beauty, ordered her son Cupid to avenge her by making Psyche enamored of the lowest of all human beings. But Cupid fell hopelessly in love with the mortal girl. Psyche’s father, in despair at seeing his daughter unmarried despite her beauty, consulted the oracle of Miletus. The oracle predicted terrible disasters if the girl were not abandoned at once on a rock, where a monster would carry her off. Alone and trembling on the rock, Psyche suddenly felt the caress of a light breeze: this signaled the coming of Zephyr, the gentle west wind. He bore her away to a marble palace covered with precious stones, which would now be her home. Each night a mysterious visitor came to Psyche’s room and made love to her. But he forbade her to try to see his face. Psyche, curious to see her lover’s face, lit her oil lamp one night as he slept and saw that he was none other than the god of Love. But a drop of burning oil suddenly woke him; and feeling betrayed, he fled. Desperate, Psyche set out in search of her lost love. Venus inflicted terrible ordeals on her, leading her from the Underworld to Olympus. For the last of these ordeals, Venus sent Psyche to Proserpina, goddess of the Underworld, ordering her to bring back a flask she should open under no circumstances. But Psyche was curious, and opened the flask. Inhaling the vapors, she fell into a deathly sleep. Cupid revived her by touching her with his arrow. Moved by such devotion, the gods finally granted Cupid Psyche’s hand. They gave her nectar and ambrosia, and this made her immortal. They then consecrated her goddess of the Soul. Price of Forever Stamps Increases Sunday! For the first time since January 2014, the price of US Postage stamps is going to increase. 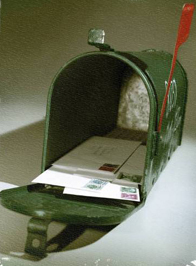 This means you’ll be paying two cents more for a First-Class Mail Forever stamp, which is currently 47 cents. The price changes will take effect on Sunday, January 22nd, 2017. 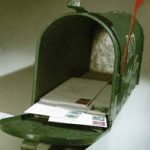 The price change does not include Postcards, letters being mailed to international destinations or for additional ounces for letters.